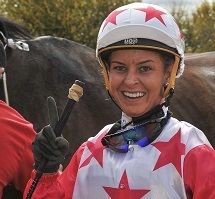 Multiple Riverina premiership trainer Trevor Sutherland has confidence in widely travelled apprentice Wendy Peel on value runners at Tuesday’s Wellington TAB meeting. Wendy Peel flashing her trademark smile after a win. Credit: Bradley Photos. Veteran Sutherland, with multiple representatives throughout the seven-race TAB programme, says Wendy’s 3.5 kg weight relief will be vital for performed gallopers Benno’s Boy and Gentleman Max to improve at lengthy odds, lumping big weights. The Scone born Peel, 25, with five rides at Wellington, initially worked at Yarraman Park before travelling to the United Kingdom, New Zealand and the USA to further her equestrian career, and when turning professional was originally apprenticed to Peter Robl at Randwick. “Wendy’s ridden for me before, they travel and relax for her, she’s a very capable apprentice- rode a couple of regional Cups winners down here for Scott Spackman,” Sutherland said. Indeed, Wendy did, winning both this year’s Tumut and Tumbarumba Cups with the Spackman trained Didn’t Even Kiss Me. “Gentleman Max and Benno’s Boy have won a lot of races for me in the bush and with the big weights they’re getting now, it’s tough placing them and you need to claim,” Sutherland said. “And no pretty riding tactics from an apprentice, just get ‘em to jump, settle and take advantage of the pull in weights. 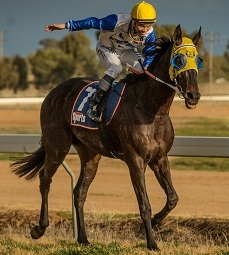 Gentleman Max (Allan Chau) salutes in the 2017 Forbes Cup. Credit: Janian McMillan. “You need to be on pace at Wellington, especially with big fields, and the draw hasn’t been kind to us. Gentleman Max, a nine-race winner has his 62.5 kg impost reduced by Wendy’s 3.5 kg claim in the Barnson Surveyor’s BM 65 (1700m). Benno’s Boy (11 wins) has a relief from his 59.5kg in the Allandale Merino Stud BM 58 (1100m). “It’d be lovely to get some rain, especially for Gentleman Max,” Sutherland said. “He’s a swimmer but they’re both holding their form well into their preparations. Greg Ryan looks certain to ride his regular winners. Wellington’s track is presently rated a good three. View the fields, form and race replays for Wellington's Tuesday meeting here.